Well, this one kind of crept up on me a bit, despite the fact that the forecast was good from several days out. It was a chance to get out if only for a back garden session, and just persevere with the local lights. It was just a shame it was a school night! So, nothing new to add to the observing list for this session, but certainly some notable targets seen. So, to kick things off, under not quite fully dark skies, I swung the SBT around in the direction of Ursa Major. Sitting not quite at azimuth and in the opposite direction to the setting sun, it seemed a sensible place to start. I started with M51, the Whirpool Galaxy, which, unfortunately was tricky to spot and hardly visible because of the still light sky. It is a target I hope to image when the correct conditions present themselves. So, I soon moved on to M108, an elliptical galaxy coming in at magnitude 10. I was able to pick out a feint smudge and the shape of the galaxy. Later, perhaps at Astrocamp in May under the dark skies of Cwmdu, I shall spend more time looking at this, and the other targets around Ursa Major. Next, a very gentle nudge bought into view M97, the Owl Nebula. Now, this wasn't the best time of night for picking feint fuzzies, so to see this target was a good achievement I felt. Finally for Ursa Major, I moved the scope around the M101, the Pinwheel Galaxy. A favorite target which actually filled the eyepiece quite well. I was observing around 10pm which meant that there were a lot of lights going on and off while people prepared to turn in for the night. It has the unfortunate effect of disturbing night vision in what actually were turning out to be very clear conditions. while going through the collimating process early in the evening, I noticed some dust marks on the primary mirror. During daylight, they didn't look too bad. However, under torchlight they seemed significantly work. Everything I read about cleaning primary mirrors for telescopes starts with the advice, DON'T unless you really need to. The issue being with the coatings on the mirror. However, I've seen some articles and tutorials on how to carry out the process without damaging the mirror. I would like to look at getting the mirror cleaned in time for Astrocamp to have the SBT working at it's best. I expect there will be a blog post coming about that soon in the coming weeks. The observing hadn't finished there. I saw Jupiter rising high above the roof tops. I wasn't within the GRS transit window. I'd missed that by several hours, I did observe it for a few minutes though, through periods of different conditions. In general, the seeing was pretty poor, with the image in the eyepiece appearing very wavy. I put this down to heat thermals rising from the roof tiles. 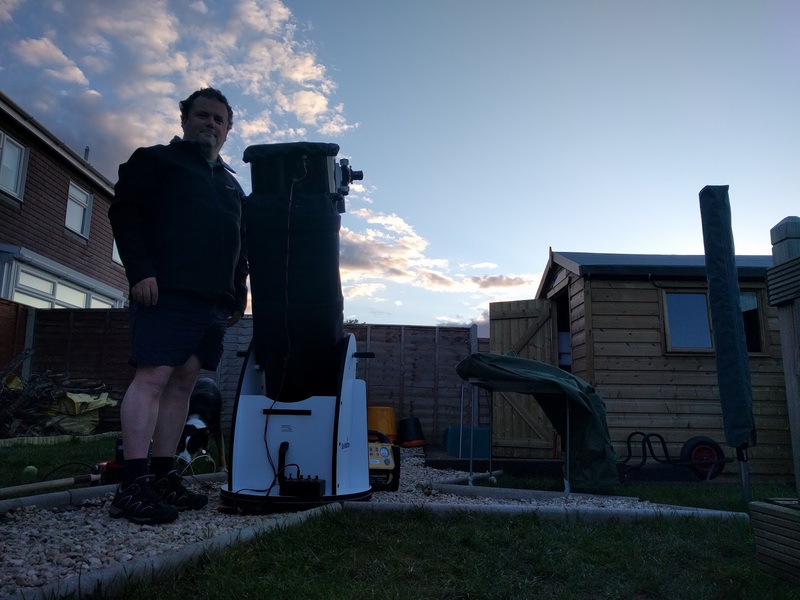 At other times though, the conditions settled down considerably allowing me to see all 4 Galilean moons and the equatorial belts of the planet. At the moment, Jupiter's path across the sky cuts through the bottom section of the constellation of Leo. So, for the first time this year, I turned my attention to seeking out my favorite targets from last year, the Leo Triplet. The Leo Triplet consists of 3 galaxies, M65, M66 and NGC 3628 just below the hind legs of the Lion. It was a pleasing site bringing back memories of the first proper outing of the SBT, and a suitable end to the session. I could have stayed out for many more hours, but with work to consider the next morning, I found myself packing away during the better conditions of the night, and after most of the residential lights had gone out for the night.